Wauseon’s fireworks display will cost approximately $25,000. Time again for the skies to sparkle over Wauseon, as the annual Fourth of July fireworks display kicks off Tuesday, July 3, at dusk at Dorothy B. Biddle Park. Ohio-based Legendary Entertainment Productions will supply the pyrotechnics during an approximately 20-minute program that will be choreographed to music by a local DJ. Spectators are encouraged to arrive for parking by no later than 9:45 p.m., when the park will close for the duration of the show. Police will enforce a specific pattern to keep traffic flowing smoothly. Wauseon Fire Chief Rick Sluder said city residents can expect the same quality booms and bangs as last Independence Day, with the production synced to music provided on a low-end FM radio channel. The frequency will be announced the day of the show on the fire department’s Facebook page and Twitter. 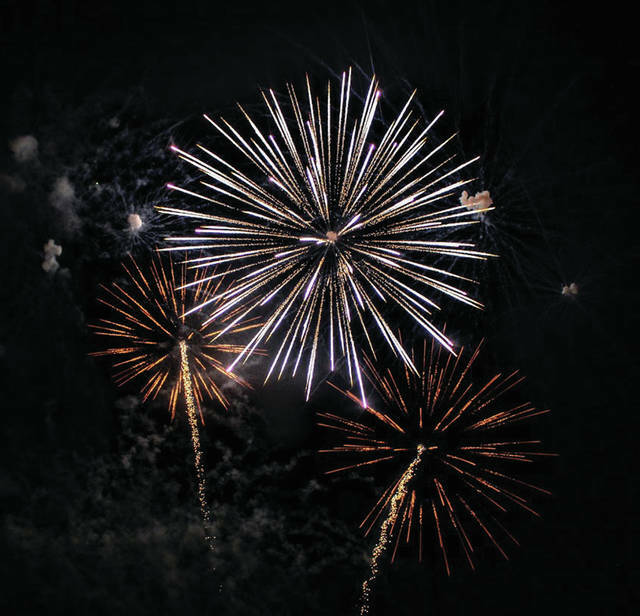 The approximately $25,000 fireworks extravaganza is provided by a fundraiser held at Tiny’s Dairy Barn on Shoop Avenue and money from the city’s general fund approved by the City Council. Between 5,000-8,000 fireworks including smaller-grade models and 200-300 high-flying rockets will be launched from the northeast corner of Biddle Park, Sluder said. A crew of 12 city firefighters trained to set off the fireworks, led by WFD member Sean Rossman, will be be assisted by Barry Peel, Steve Krosky, and Steve Kaiser, Legendary Entertainment employees. The logistics of electronic firing allow for the crew members to safely remain hundreds of feet from the actual fireworks. The fireworks themselves are removed from a secured bunker in Indiana and brought to Wauseon the day of the show. Prep work by city employees takes hours beforehand. Many of the fireworks are ground-level effect related, which keep them lower in the night sky. “They don’t go real high because it puts on a nicer show for less money,” Sluder said. The holiday dazzler is held July 3 to save the city overtime pay for its employees involved in preparing for the show. It also gives those workers July 4th off to enjoy with their families, and eliminates a late night for citizens prior to July 5 work schedules. He said the addition of the new city pool this year will only add to the entertainment of the show. “Everybody enjoy the pool, then they can come down to the fireworks,” he said. https://www.fcnews.org/wp-content/uploads/sites/45/2018/06/web1_Wauseon-Fourth-of-July.jpgWauseon’s fireworks display will cost approximately $25,000.